Penn Manor High School will host “Heroin: A Community Conversation,” a public forum on the opioid and heroin epidemic, at 7 p.m. March 21 in the high school auditorium. Over the past four years, drug overdose deaths in Lancaster Count have more than tripled, due largely to the widespread availability of heroin in our communities. 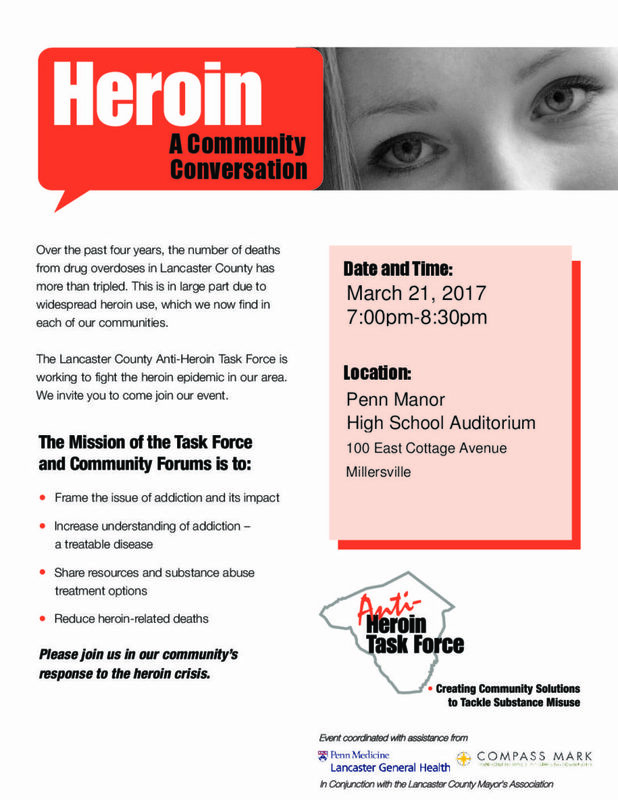 The forum, sponsored by the Anti-Heroin Task Force and other community partners, will address the impact of the epidemic and include personal stories about people in recovery and the community resources available to help those in need. The goal is to increase public understanding of the problem and reduce drug-related deaths. State Sen. Scott Martin and state Rep. Bryan Cutler will participate, along with medical professionals, addiction specialists and service providers. Please join in this important discussion by attending the forum.